Welcome welcome! Today's a big day, my friends - it's Week 1 of the One Room Challenge! What's this One Room Challenge, you say? Well let me fill you in! The ORC is a twice-yearly decorating event where folks transform a room over the course of six weeks and share all the progress along the way. 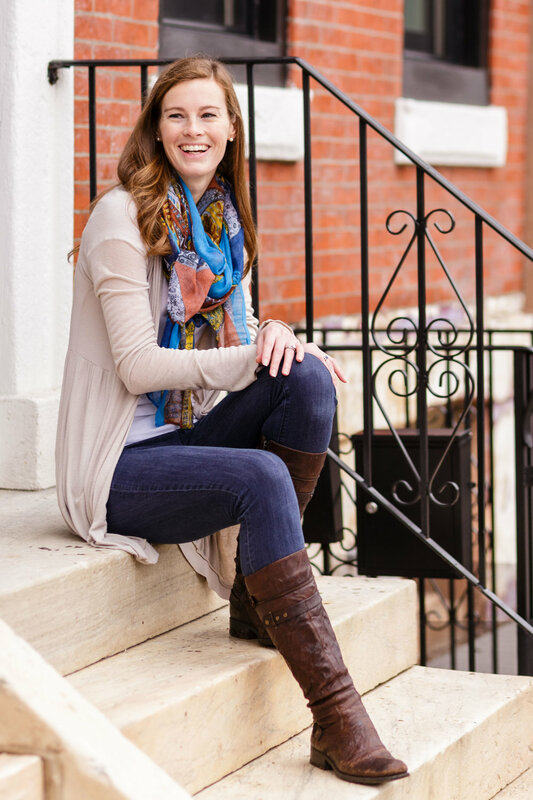 Each week, the featured designers and guest participants (that's me!) will talk about what's happening with their spaces - the good, bad, and ugly. I've participated once before (check out my home office makeover here! ), so I have a good idea of what to expect, but you never know what's going to happen until you get into it no matter how much you plan in advance. Wish me luck! Every Thursday from now until May 10th, I'm inviting you to come on over to the blog to watch this room come to life! 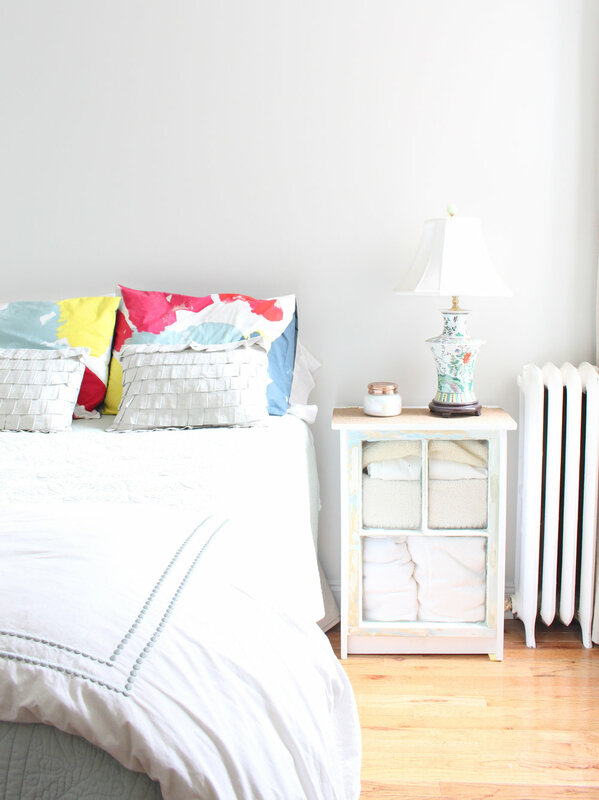 This year, I'll be tackling our blah and forgotten guest bedroom. This poor room has been the recipient of pretty much only our castoff furniture, decor, and bedding - it's basically the equivalent of a second child that got all the hand-me-downs from an older sibling. The hodgepodge collection has certainly been functional for the past few years, but it definitely isn't anything special to write home about. The only piece of furniture that's staying in this room is the tall wood dresser, which is one of my favorite family pieces that I got from my grandparents after they passed away. You'll catch a glimpse of it in a minute. Today I want to share the before photos as well as some of the inspiration behind the design I'm planning. You'll have to wait a week to see the actual design and the floor plan - I'll be leaving you in a bit of suspense at the end of this post! The true before photos start with the real estate photo from the house listing that I've always found slightly terrifying. We knew this house had a lot of potential, but this photo of our future guest bedroom with all those pigs cutouts and animal masks wasn't exactly enticing us to make an offer. The house needed a lot of work in general - thankfully we could see past its issues though and have enjoyed giving it a top to bottom makeover over the past several years! Once we took possession of our little 1200 square foot row house in Philadelphia back in 2015, we spent a month renovating to get it to a "clean slate" state. We ripped out all the wall-to-wall-carpeting, and every room got new hardwood floors and a fresh coat of paint. It made such a big difference! After that, we set up our guest bedroom with a mattress on a plain old metal bedframe (no headboard! ), added the dresser, grabbed some random side tables and lamps, and pretty much called it a day. The random assortment of bedding used to belong to our master bedroom and I threw in a few additional items I had in storage. It wasn't horrible, but like I mentioned in the intro, it wasn't anything to write home about. Our guests never complained, but after living with it like this for a couple of years, I knew this was the year to finally put some effort into it. The other reason I want to give this room a true transformation is because my style has changed pretty significantly over the past few years. It's become a whole lot more eclectic and you'll definitely see a mix of styles come together in this space. This is the last room in our house that needs serious help and finishing it off this spring is going to be both an achievement and a little bit sad - after all, I am a designer, so running out of rooms to finish is bittersweet. With that back story and the before photos in mind, let's jump into the inspiration. This small guest room is about to get some big personality! In case it wasn't obvious from the first inspiration photo above, this room is getting WALLPAPER! I'm so excited. 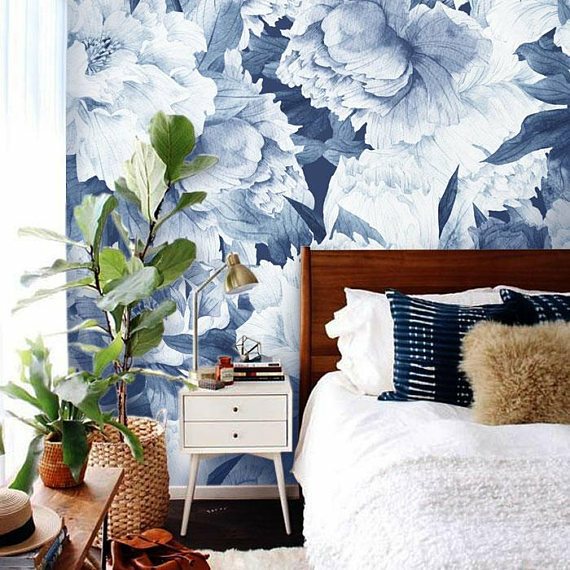 I'll be doing an accent wall behind the bed in the most beautiful watercolor floral removable wallpaper. It's going to be the first thing you see when you peer into the room and it's going to make a major statement. I'm having a hard time putting a name to the overall style for this room since it really does marry several different styles. It has mid-century and modern elements, a touch of farmhouse, and a bit of California eclectic. I'm dubbing it "eclectic modern farmhouse" for now, but we'll see if that sticks as I get into the process. I'll be going with a blue, green, and white overall color scheme, and the room will have a similar feel to the Studio McGee image above and Ginny's living room (via Emily Henderson) below. I really want to capture that lived-in feel, but I also want it to be clean and uncluttered. After all, this room only measures about 10'x11', so you can only put so much stuff in there! That's all for now! I can't wait to start bringing this room to life over the next five weeks. Come on back next week and see the full plan for this guest bedroom! Head to Week 2 here!